Panama is fascinating. 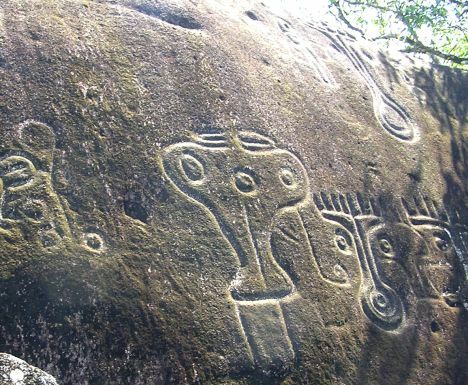 If you are one of those people that love the mysterious and un-explained, then this is the place for you-it has mysteries that archeologists haven’t begun to solve. 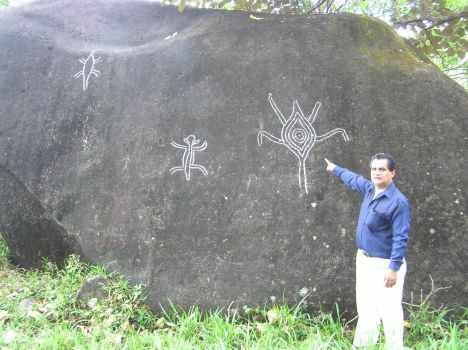 In late December I was passing the turn off to Caldera village, just south of Boquete when I spotted the sign for the “Piedra Pintada’s.” or painted rocks. I promised my wife the detour would only take, “tops” half an hour – actually it took the rest of the day. You need to be an avid explorer or like myself, a bulldog reporter to find these places – the lack of signs and directions almost makes you believe the locals want to hide these things. After a three Kilometer drive we arrived in the Village of Caldera. The place was like a cemetery- not a living soul to be seen. There was an old rusted sign but it pointed to the middle of someone’s house – “can’t be in there,” I thought. The sign actually pointed through the house and then half a mile further into the countryside. Fortunately I found a local, in what appears to be the town drinking hole. His name was Juan Guitierez. He led me across the dance floor of the bar and out into an open field. After half a mile or so we passed a series of dark, mysterious rocks. My excited series of finger pointing at likely candidate rocks were met by an equal series of “no, none of these.” Eventually, into view, came a large rock at the edge of a stream. This was the main Caldera petroglyph. The rock was about eight or nine feet high and about 16 to 18 feet long. There were carvings all over it- mainly animal figures including a lion and some bulls but the most intriguing feature was carved on its north-west corner. Juan excitedly told me that this was believed to be a carving of a UFO. Sure enough it had the shape of something unearthly, with possible exhaust flames coming from underneath. Its planetary connection might well have been that it seemed to show the alignment of the three main stars of Orion’s belt. Those astute amongst my readers will immediately recognize that this corresponds to the supposed alignment of the great pyramids of Giza. I asked if there were any accounts of UFO activity in the Caldera area. Surprisingly Juan said that there were not. However, he did add that the west side of the Baru Volcano-the Volcan area, was well know for sightings of strange lights. 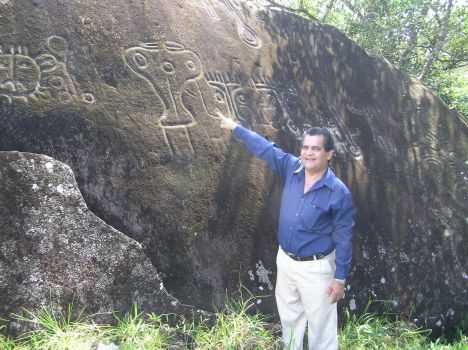 Juan then took me on a tour of several other petroglyphs. Unless you had a guide you would never have found these. 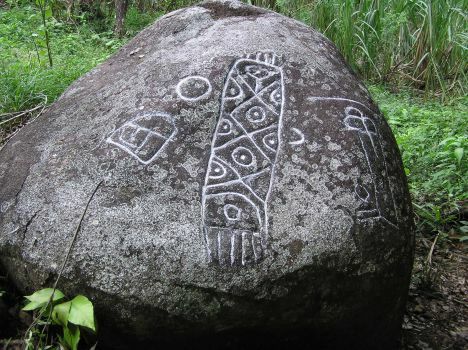 The first, was some three kilometers away and had a large star shaped carving in the middle. A kilometer nearer to town was a flat stone with a carving of a human foot, which seemed to indicate a path way to some long extinct village. The final stone was some 20 minutes farther east of Caldera. This was the most surprising of them all as it may have been an early attempt at a calendar. On one side of the patterned rock was a sun sign and on the other, a crescent moon. The patterns could have signified seasons or phases of the moon. On returning to Caldera Village Juan saved his best piece for last. 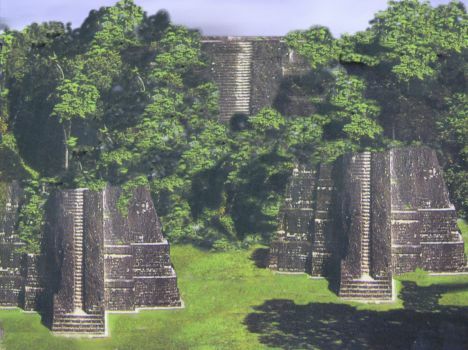 He claims that there is a lost Mayan city in the jungles of Bocas del Torro. A local architect and explorer friend of his has travelled there. His friend was not allowed to take pictures and was led blindfold to the site so as to keep its exact location secret. 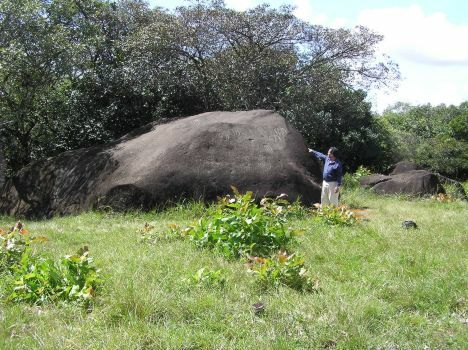 Allegedly the site contains three truncated Mayan pyramids. They measure five meters high and are about six meters along each side. People I have talked to dispute that they exist. Juan has invited me to go on an expedition to find them. My dear lady wife has said, “not a chance in hell are you going,” However if there are any aspiring archeologist / adventurers out there who are up to the challenge, this is my email address.